Mary Whyte's illustrations take this nostalgic story to the next level. The three-dimensional rural landscapes and dreamy quality of the scarecrow legend absorbs readers. While seemingly stereotypical, the apron and blue-jean clad grandparents are realistically drawn country folk who typified the experience of the previous generation. Lovely to linger over the detailed illustrations and locate the scarecrow hidden in each page. GREAT STORY! I'm not a fan of the dialogue (which, IMHO always makes a story unnecessarily longer). The artwork is lovely and gentle and detailed, reminds me of Ted Rand's style, which I have always loved. 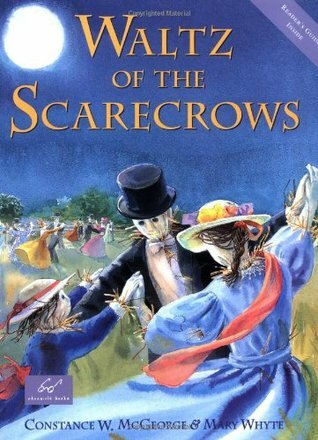 Awesome perspective through the flock of crows to the ground!Anyway, this will be a great companion for my scarecrow story package which includes The Scarecrow's Hat by Ken Brown and the Scarebird by Sid Fleishman and of course the Dingle Dangle Scarecrow poem. And Two little blackbirds sitting on a hill, one named Jack and the other named Jill. I love this book so much i created a "favorite-kids-books" shelf to house it. Rowan asked to read it again right after we finished, which gives me some hope for her taste in books (to counteract all the Daisy Meadows fairy books she wants me to read to her). The illustrations are perfectly integrated with the story and in fact, the illustrations get the last word (so to speak). But don't let me ruin it for you, read it for yourself, even if you don't have kids. A cute book of one little girl's stay with her grandparents and learning the town's history that has led to formally dressed scarecrow. The illustrations are beautifully done and realistic. Part of the fun for me was to see where the tuxedo cat would appear next when he did so. The only part that was a bit off for me was the title. The way it is presented could have been elaborated on more then it was but still the ending was okay. If I added all the children's picture story books I've read--well my list would be in the hundred of hundreds. But I want to keep a list of the great ones for future grandchildren and for retelling favorite library books.This book is perfect. A little girl visiting her grandparents farm help them construct scarecrows dressed to the nines. Why they dress the scarecrows in such finery is the basic plot! Great for my dgc and they are aged 3 to 8. A little girl learns the legend of the waltzing scarecrows from her grandparents. The illustrations and story are appealing. I found myself lost in the story. It is a bit suspenseful and this would appeal to children. This story would interest any primary student. This book is about a memory a girl has with her grandparents. Waltz of the Scarecrows could be used in language arts to teach about memoir and personal narrative. It is also good to use for prediction. The illustrations are also very intriguing and vivid. This is very sweet book about a little girl and her grandparents. It would be a good story to read to young students at Halloween because it isn't scary and doesn't have ghosts or monsters. Could be used for predicting the ending. Loved this one! Love its family history and being able to create a connection between grandparent and grandchild.